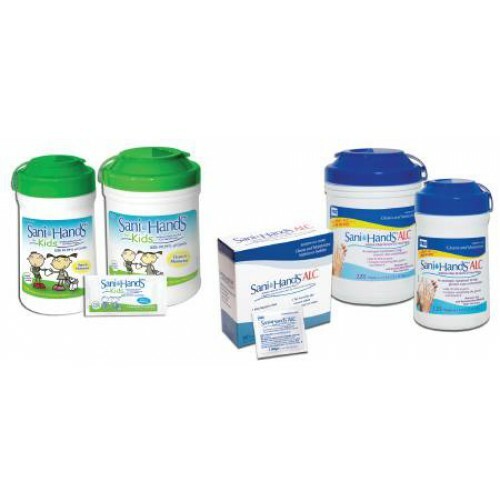 Sani-Hands® Antimicrobial Gel Wipes by Professional Disposables (PDI) are alcohol-based sanitation wipes meant to kill harmful microbes on the hands and skin. These disposable wipes clean, eliminate microbes, and moisturize all in one shot. The wipes contain aloe, gylcerin and Vitamin E. Made for convenience, these wipes simply pull out of a self-sealing canister. They are perfect for times when antimicrobial soap and water are not close by. These disinfectant towelettes are pre-soaked in a antimicrobial gel that, when combined with the rubbing friction from the wipe material, kills 99.99 percent of microorganisms. They don't dry the skin, but instead moisturizes, and even keeps skin irritation-free after repeated use.